As we wind down our work day, some of us feel a need to top the 9-10 hour grind with non-work related happiness. From 8:30ish to 5:30ish, Portlanders soak up LCD rays with the desire to get more satisfaction out of life. This behavior is what Henry IIX called “hobbies”. Portland’s #1 hobby is the Happy Hour. Portlander’s testify to the glorifying nature of “Happy Hour” and the levels of pleasure it has brought us over the years. Meeting friends/coworkers/lovers after a mediocre-to-hard days work can instantly transform a crappy day into a fantastic one. However, the once heralded Portland happy hour seems to be in decline. As 4-6 pm becomes the staple, I’ve found the ease to be “happy” after work fading away. In the professional world, a work day never ends at 5. For the few times you have left before 5:30, I can only imagine the sheer guilt consuming you. Leaving before projects have been completed to provide the body with sustenance* will add to your unhappiness. 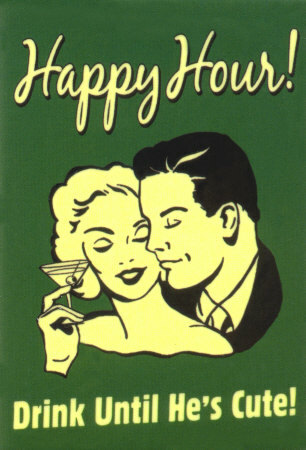 Why are the old popular happy hour joints suddenly shortening their hours to 4-6? We can blame this decrease on the general popularity of happy hour, Californians, or point our finger at the Oregon Restaurant Association. The Oregon Restaurant Association has been building a media campaign in which Portland provides the ultimate culinary experience. The pretentious vile spewing from this PR frenzy has led smaller restaurants with bars to up-the-ante and go “high class,” setting aside the happy hour. Old happy hour staples such as Portland City Grill and Henry’s have been raising prices, shrinking hours and offering less options for the hungry and thirsty. If you are not a restaurant, per se, the down economy and increased number of bars will probably do you in. Brazen Bean, once heralded for its happy hour, closed doors this year in a confusing hurry. At 6 O’clock, you can still see 23 year old women standing in front of the ol’ Bean doors, madly making phone calls in an attempt to find cheap martinis. In the past three years, I’ve noticed a complete dwindling of shock appeal, as far as awesome happy hours deals go. Now, as the $4 Quesadilla and $2.50 Pabst becomes the staple for more established joints, I find a complete disinterest in having to hunt for a great happy hour in some smokey dive bar (*Cough* Low Brow *Cough*). Fellow Portlanders, please share those remaining happy hour gems which still offer jaw-dropping deals. Your fellow citizens will love you for it. Otherwise, we will have to find real hobbies. like The University of Phoenix, Intercontinental University Online and Kaplan. Are you sure you got your Roman numerals right? hey this site has all the happy hours in PDX and you can narrow it down to the area and kind of specials you are looking for… http://www.gotime.com/portland found it after stumbling across their iphone app. Check out Kell’s Irish Restaurant and Pub on SW 2nd Ave. downtown. Its got a great menu, but the happy hour hours could be a little more desirable. M-F it’s only 4-7, and then again from 10 to midnight. Weekend hours change. But drinks are 3 bucks, and theres a really big happy hour menu that brings prices down from around 8 bucks to 3 on all items. Tube on NW 3rd and Couch has $2 drinks and cheap beer everyday untill 10. If you tip reliably the pours get strong. Low Brow Lounge is smoke-free, according to Barflymag. Maybe that happened after the blog entry. Not to be a prick or anything, but “Henry IIX” should actually be “Henry VIII”. How about the lack of lunch specials? When I lived in Kansas City, I knew the weekly lunch specials at a dozen restaurants. Here, if there is a special at all, it’s either $.50 off one of their regular items or, a different kind of omelet that’s at least as expensive as anything else on the menu. Oh, don’t forget the McCormick and Schmick’s $2 burger. Or Jake’s (yeah, I know it’s just another McCormick’s really..). and Ringside’s late night food happy hour is phenomenal. Lucky Lab in NW has good beer deals on Monday and Tuesday and just started serving pizza for a few bucks, so that’s pretty cheap too. Off the top of my head I can name 2 great happy hours. Veritable Quandary from 4-7 has 20% – 50% off the bar menu which is filled with seasonal local cuisine (and a mean burger). While still in the narrow 4-6 window The Carafe on Market by Keller Auditorium offers the best bang for your buck. Half price beers, a 3 dollar Croque Monsieur (go madame for a dollar) , cut-rate escargot and a number of other choice Parisian bites (even foie gras!) are on offer at this under the radar French Bistro all week. While there has definitely been an over-all decline in the happy-hour experience lately there are some good ones out there. If you get out of the played out NW/Pearl dining scene where “fine dining” – defined as overpriced, so-cal inspired, cliche fusion menus served in what could only be described as the dining room from THX 1138 where the food is as beige, tan, grey and bland as the people eating it – you’ll be pleasantly surprised. Check out Southeast, Alberta and 20th, even good old SW has some great spots. This trend is by far focused on the trendy third and Pearl Disrict.